Hand-crafted in our own kitchen in small batches using time-honored Vermont recipes and the best ingredients. We use the freshest pork possible and season with our own delicate blend of spices. To our maple sausage we add the perfect blend of our own Pure Vermont Maple Syrup and Maple Sugar. Our savory pork sausage delights are far leaner and more flavorful than any you will find elsewhere. A perfect breakfast includes Dakin sausages (or bacon), eggs, a starch, and fruit. My most recent purchase accompanied French Toast on Christmas morning. 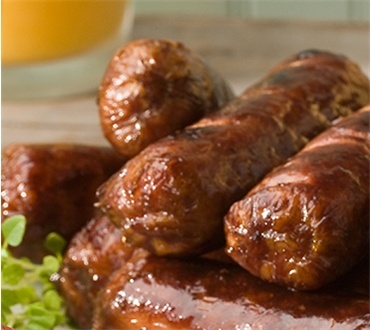 Dakins sausages turn any breakfast into a great meal ! I used both products for "Breakfast and snacks. What a fabulous product. I can't explain how wonderful my sausages were...The Dakin Co. did very well...I will continue to buy! This sausage is the reason why my husband and I send Dakin Farm gift baskets every Christmas. We haven't been able find sausage this tasty in any store. It's exceptional. Wonderful for breakfast ~ great for snacking.Great flavor ~ easy to prepare.